An Affordable Alternative to Plaster! -- Architecturally Richer Than Wood! 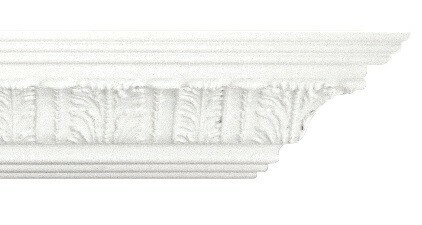 EliteTrim cornice moulding offers the rich, carved detailing of expensive architectural wood mouldings or plaster, at a much more affordable price. What makes EliteTrim mouldings especially distinctive is the intricacy of the detailed patterns embossed on the face, replicating the opulent carvings of high-end architectural mouldings. Using a process which Elite Trimworks has adapted from the picture frame industry in Italy, we can apply a pattern using wood paste to any wooden trim. If your project requires a stain finish, hardwood trims can also be embossed to create more architecturally rich room. Paint grade, MDF is less likely to warp or expand due to the lack of grain and the cost is far less than solid wood. All embossed MDF EliteTrim comes primed white so painting is a snap! You put it up with a few brad nails, paint it and you are done. It is a wonderful option where the ornate shape of plaster is not required. Depending on your preference; you have options to work with. Our primed, MDF mouldings come in a variety of types and patters and ship within a day of ordering. The Hardwood mouldings are made to order and will require two to three weeks before shipping.